This year Vedanta was again excluded from the Norwegian Pension Fund investments following a report which found “numerous reports of Vedanta’s failure to comply with government requirements” at four subsidiaries in Odisha, Chhatisgarh, Tamil Nadu and Zambia. In Goa, India, resumption of iron ore mining by Vedanta subsidiary Sesa Goa has already led to protests by Gowda Adivasis (a tribal group) suffering from air and water pollution, and accusations that the company is already exceeding its quota and continuing illegal mining under the guise of removing waste dumps. 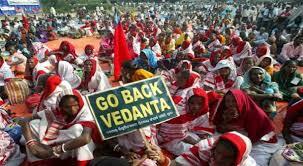 After being found guilty of widespread illegal mining Vedanta is already demanding that the resultant cap on mining is lifted. In Niyamgiri, Odisha, harassment of tribal activists who succeeded in stopping Vedanta’s bauxite mine in a precedent referendum in 2013 is increasing, and key activists have been jailed and tortured this year, accused of being Maoists. Niyamgiri Suraksha Samiti (NSS) and the Dongria Kondshave held major blockades of Vedanta’s refinery in reaction demanding an end to harassment and the decomissioning of the refinery. Parallel demonstrations are already planned in Zambia and India on the 14th August for this Global Day of Action and questions raised by the communities will be asked inside the AGM meeting.If you would like to plan a demonstration or organise any event in solidarity with any Vedanta affected community, in any part of the world please get in touch.